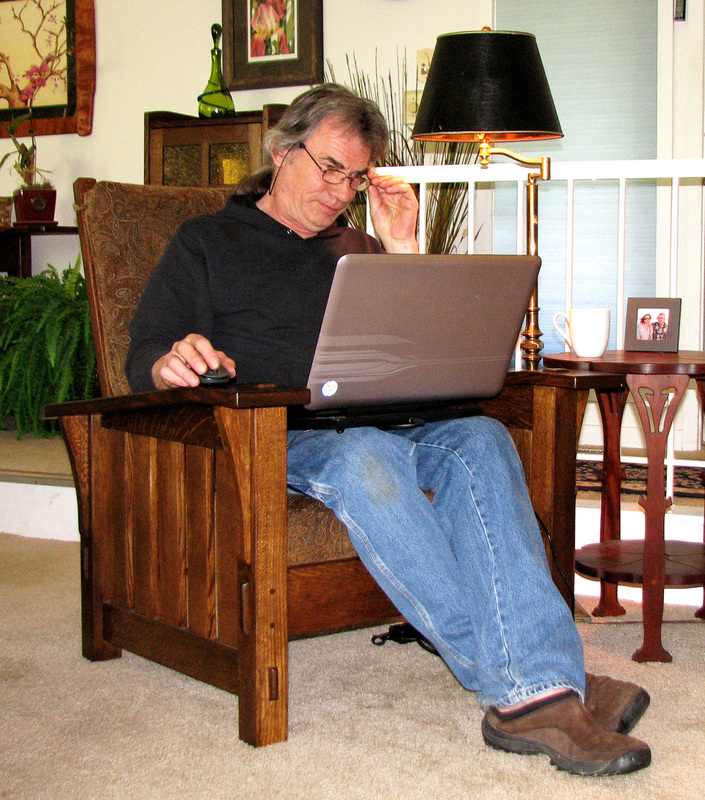 Robert W. Lang is executive editor of Popular Woodworking Magazine, and the author of several books including “Woodworker’s Guide to SketchUp.” Bob blogs about Woodworking and SketchUp at his website ReadWatchDo.com. We asked him to tell us a little bit about his process and why he uses SketchUp Pro. Building furniture is a rewarding process. Most of the challenge is problem solving; time in the shop is always in short supply and quality materials aren’t cheap. Good problem solving at the start allows a more efficient build and prevents costly mistakes. Early in my career, I fancied myself a designer and vowed to only create original designs. Then one day I read something from Gustav Stickley to the effect that if you wanted the ability to design new work, you needed to thoroughly understand everything that had been done before. Twenty-five years later, my work is mostly reproducing designs from the Arts & Crafts period of the early 20th century. This chair (below) is a Stickley piece, and despite its simple appearance there are a lot of subtleties to the overall design. These quirks are what make this furniture intriguing—the closer you look, the more you find. When I'm planning a reproduction, I work a lot from photographs. My process is mainly the same one I used years ago with pencil and paper. Importing a photo, scaling it to actual size and measuring the photo on screen are far easier (and more accurate) than staring through a magnifying glass and using a proportional rule. If possible, I work from photos I've taken myself; these are different than photos taken for publication. I'm looking for information, and the best source of that is a straight-on view. I'll do some things in Photoshop, sometimes correcting for lens distortion, but mostly I adjust the image to make it easier to discern details. After I import a picture into SketchUp, I scale it so that parts I can measure with the Tape Measure tool match known dimensions. I place the images on a separate layer, so I can easily turn them off and on as I build the model. I usually build the model near the photos, but for some parts I work on top of them. To get the outline of the corbel under the arm, I traced the shape on top of the image, then extruded it to the proper thickness with Push/Pull. I import photos into SketchUp and scale them to a known dimension. Sometimes I model next to the photo, and sometimes I trace directly over the photo. Sometimes the photo will reveal something I'd rather not see. The next image is from early on in the process, right before I discovered that the lower rail between the front and back legs isn't parallel to the floor, as I have it in the model. That slight angle adds a lot to the appearance of the finished chair. It's the chair's way of saying “Come and have a seat!”, but it makes building the side assemblies considerably more difficult. Instead of five identical vertical slats, each one is a bit longer than its neighbor. Additionally, the shoulders of the tenons have to be cut at an angle rather than square. 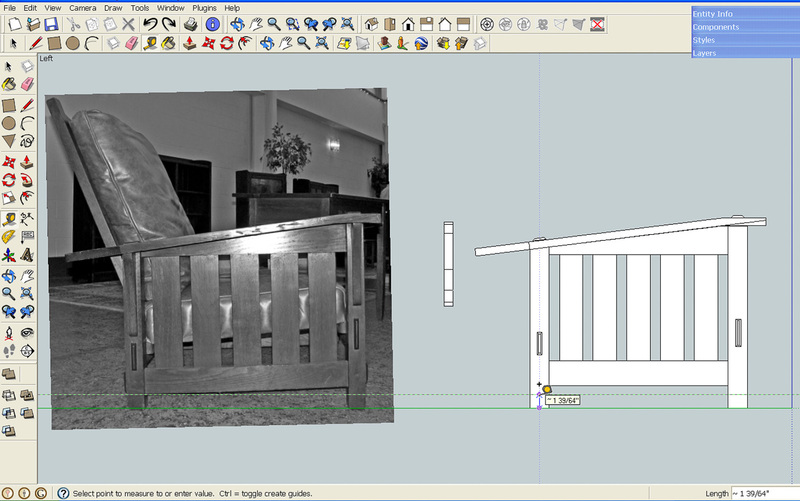 With the photo available within the model for reference, I can check dimensions and details while I work. In this case I realized my first attempt missed an important but subtle detail. Eventually, I have a model that I'm happy with; I consider this the halfway point of the process. The second half is extracting information from the model. Everything I want or need to know about every part of this chair is there on screen. Now the task is to pull out the information I need (or want to show someone else) and to put it a manageable form. In the shop I tend to spread out until the project I'm working on covers every available horizontal surface. I follow much the same process when working in SketchUp: I make copies of the entire model (or portions of it) off in empty space somewhere to serve different functions. I create scenes for each of these views, with layers for dimensions, so I can export or print only that portion of the model. If you back up and look at everything, it's pretty chaotic. Zoom Extents makes it look like I’ve made a horrible mess, but I generated several scenes in a short period of time, each showing important details by copying portions of the model and moving them into empty space. That said, each scene has a lot of value; there are a number of ways scenes can be used. In my work on books of measured drawings and for Popular Woodworking Magazine, scenes are exported to Adobe Illustrator to use for two dimensional drawings (plans, sections and elevations) or three dimensional exploded views. This is a typical Scene that I will print and take to the shop to use as a reference for each part of a complex assembly. The model contains precise information about every part, and if I forget to print a dimension I’ll fire up the laptop, open the model for a closer look and measure the parts in the model. For a project build video, I exported an animation of several scenes and used that clip in the finished video to explain the construction process. For my own use in the shop, I print 3D views of groups of parts and stages of the process for reference. For the side assemblies of this chair, I printed exploded views as well as details such as the image of the leg joinery. In SketchUp, it doesn't take long to create these extra views. So far, when I wonder “Can I do this with the model?” the answer has been, “Yes I can, it works very well, and it doesn't take very long”. Instead of standard cutlists, I create views such as this to accurately lay out the parts. 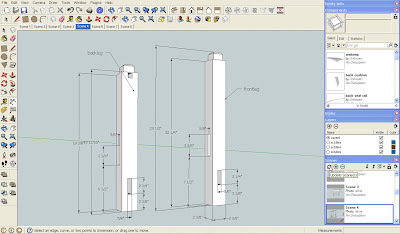 It might take 5 minutes to drag each leg out of the Components window and add dimensions, and it saves hours in the shop. It’s surprising how close this is to having real parts to refer to. 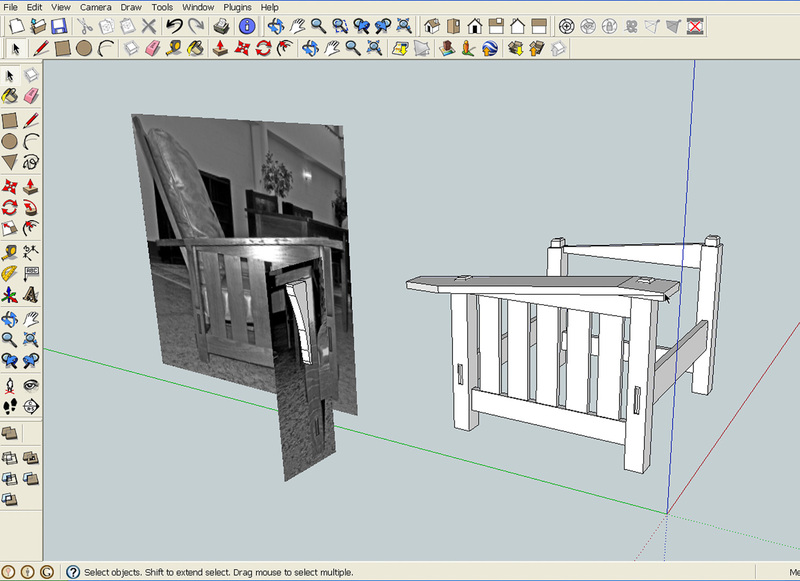 One unexpected benefit of using SketchUp is that it turns out to also be a great tool for teaching woodworking. Unlike a valuable antique, a 3D model can be taken apart to study how it goes together. When I teach a class on building a piece for real, one of the main lessons is the sequence of doing the work. 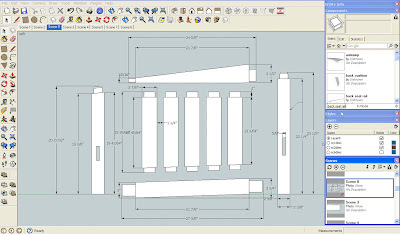 This is a crucial skill for successful building; knowing which parts to layout and cut first, how those first parts affect the following parts, and how to group parts together in sub-assemblies to make the final assembly simple. With a good model, an inexperienced builder can work all of that out before getting to the shop, learn the lesson in less time and not risk wasting valuable materials or shop time. The boost in confidence from this makes a significant difference in both the quality of the time spent building and in the quality of the finished product. Reproducing a Stickley Morris chair is a lot of work, but there is a built in reward when the job is done. Over the last 30 years, I’ve invested a considerable amount of money in tools to do my job. A large portion of that has been spent on computer hardware and software. 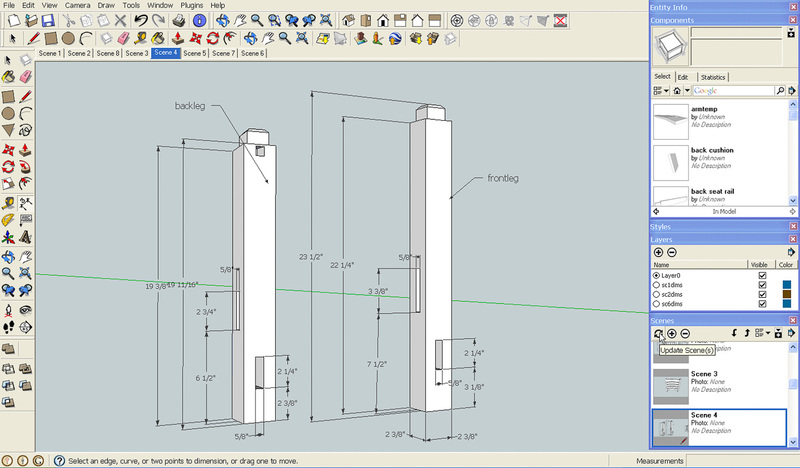 Looking back, the best investment has been the money I spent on SketchUp Pro. I started using SketchUp thinking it might be an effective drafting tool, but it's turned out to be much more than that. This simple-to-use software program is the best thing I’ve found for all phases of design, engineering, planning and communicating. Congrats on the SU Blog article. You do nice and interesting work. I too am a woodworker, albeit a hobbyist and severely lacking a suitable work space (currently "trying" to work in a 8'1" x 48' tractor trailer !!). It's impossible to set up my Excalibur Sliding Table, let alone simply cut a sheet of plywood without it. But it is good tinkering space. I would really love to do it full time in a good space though. Then I could take advantage of much of what you illustrate on your website etc. 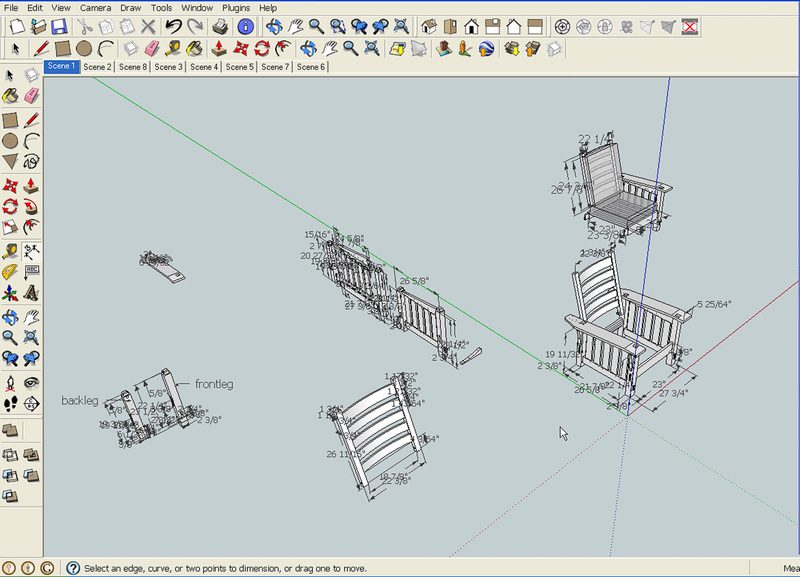 I completely agree that sketchup provides one of the best experiences for designing woodworking projects. It is a awesome plugin that i found to produce a cutlist for all the parts. 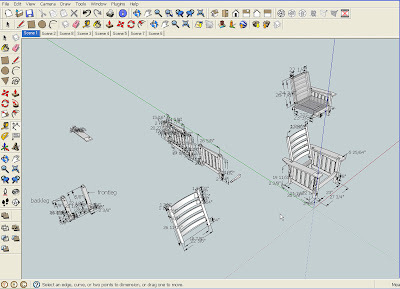 Without going into further detail, this is a must have for sketchup for woodworkers and it is free. A real timesaver. That's one of the great things about SketchUp, you can find out if it works for you on the free version, and do an incredible amount of work with that. Eventually, you hit a point where the features of "Pro" add enough to make it a bargain. I have used Sketchup in the past. I have never really became very efficient at it. 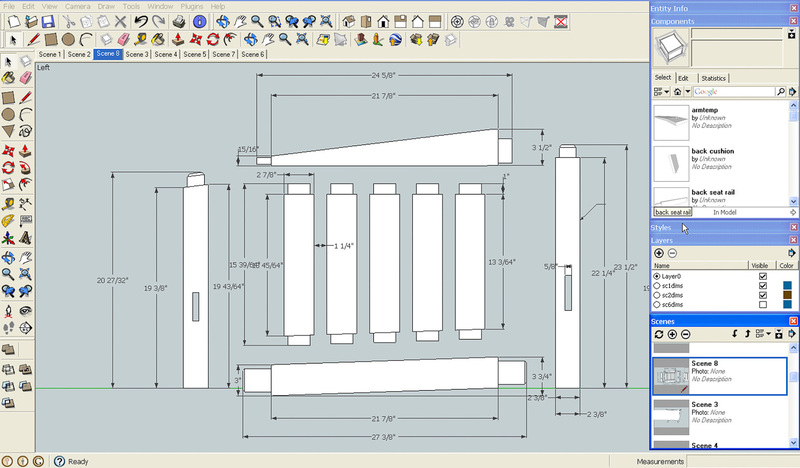 I designed my outdoor kitchen with the program along with dimensions. This helped me while building it tremendously. While I'm currently recovering from Knee surgery and unable to do anything productive, I have become determined to learn this where it becomes 2nd nature. Today I purchased Bob Lang’s CD. There is a lot of free help out there but sorting through it and finding ones that are not for Mac is a big time consumer. On the website Lumberjocks Bob has received many positive reviews on his help CD from woodworker’s whom I respect. I look fwd to becoming more efficient and possibly needed to get the pro version if need be. Thx Bob and everyone at Google.